Louise Bourgeois (1911 - 2010), UNTITLED, Circa 1970. Oval: Paint on board, 47 x 59 inches (oval), 119.4 x 149.9 centimeters (oval). 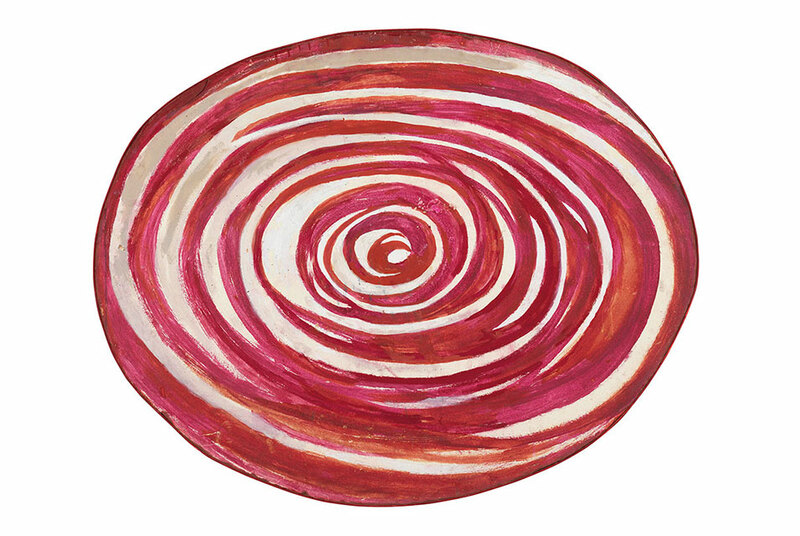 NEW YORK, NY.- Cheim & Read is presenting Louise Bourgeois: Spiral, the gallerys ninth solo exhibition devoted to the artists work. The show explores the range of Bourgeois spiral motifs as expressed in sculpture, painting, and drawing, from the early 1950s through 2010, the year of her death. It also includes a series of spiral word drawings made on blue paper in 1986. The exhibition, the final offering in the gallerys current Chelsea location, opened on November 8, 2018, and runs through December 22. In materials as diverse as wood, steel, bronze, latex, marble, plaster, resin, hemp, lead, ink, pencil, crayon, woodcut, watercolor, and gouache, Bourgeois investigates every imaginable manifestation of the spiral, from graphic patterns to graphite whorls, wobbly orbits to chiseled vortices, twisted columns to coiling snakes, staircases, and pyramids. The cursive blue-paper word drawings, in English and French, complement the purely visual works by conveying the spirit of Bourgeois poetry in extraordinary pictorial forms. Louise Bourgeois was born in Paris in 1911 and lived in New York from 1938 until her death in 2010. She was named Officer of the Order of Arts and Letters by the French minister of culture in 1983. Other honors included the Grand Prix National de Sculpture from the French government in 1991; the National Medal of Arts, presented to her by President Bill Clinton in 1997; the first lifetime achievement award from the International Sculpture Center in Washington, DC; and election as a fellow of the American Academy of Arts and Sciences. In 1993 she was chosen to represent the United States at the Venice Biennale. Her work appears in the most important museum collections worldwide and has been the subject of several major traveling retrospectives organized by the Tate Modern, London; Centre Georges Pompidou, Paris; The Brooklyn Museum; and The Kunstverein, Frankfurt. In 2016, Cheim & Read presented Louise Bourgeois: Holograms, the first New York exhibition devoted exclusively to this little-known aspect of the artists long, groundbreaking career.